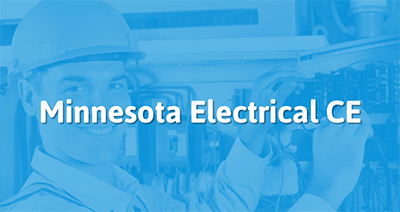 Our courses are approved by the Minnesota Department of Labor and Industry to satisfy your electrician's license continuing education requirements (DLI education sponsor ID: #S1672153). You can find our courses on the DLI approved courses list as '1 Above'. Classes are delivered using cutting edge software. Complete your CE on your computer, tablet or smart phone! Click here to view our courses listed under 'Approved continuing education courses' on the MN DLI Web site. The following license types are required to complete 16 hours of continuing education every two years. The following license types are required to take 2 hours of continuing education annually. A portion of your CE hours must cover the NEC Code Updates. Depending on your license type you may also take hours in approved non-code courses. All Electrical Licensees can take all code courses to meet their CE hour requirements. This 2 hour course is designed to help you meet your continuing education requirements by covering changes made to Chapter 2 of the 2017 NEC. The course has been approved by the State of Minnesota and will be reviewing code for the following subject - Wiring & Protection. This course is designed to meet all of your continuing education requirements by covering changes made to Chapters 2-9 of the 2017 NEC. The course has been approved by the Minnesota Board of Electrical Contractors and will be reviewing code for the following subjects, wiring & protection, wiring methods & materials, equipment for general use, special occupancies, and special conditions. This 2 hour course is designed to help you meet your continuing education requirements by covering changes made to Chapters 3, 8, & 9 of the 2017 NEC. The course has been approved by the State of Minnesota and will be reviewing code for the following subjects, wiring methods & materials, communication systems, and informative annexes. This 2 hour course is designed to help you meet your continuing education requirements by covering changes made to Chapter 7 of the 2017 NEC. The course has been approved by the State of Minnesota and will be reviewing code for the following subject - Special Conditions. This 1 hour course is designed to help you meet your continuing education requirements by covering changes made to Chapter 1 of the 2017 NEC. The course has been approved by the State of Minnesota and will be reviewing code for the following subjects, the code review process, code wide changes, new articles, and the requirements for electrical installations. This course is designed to meet your continuing education requirements by covering changes made to Chapters 1, 4 & 6 of the 2017 NEC. The course has been approved by the Minnesota Board of Electrical Contractors and will be reviewing code for the following subjects, the code review process, code wide changes, new articles, the requirements for electrical installations, special equipment, and equipment for general use. This 4 hour course is designed to help you meet your continuing education requirements by covering changes made to Chapter 6 of the 2017 NEC. The course has been approved by the State of Minnesota and will be reviewing code for the following subject - Special Equipment. This 3 hour course is designed to help you meet your continuing education requirements by covering changes made to Chapter 4 of the 2017 NEC. The course has been approved by the State of Minnesota and will be reviewing code for the following subject - Equipment for General Use. This 3 hour course is designed to help you meet your continuing education requirements by covering changes made to Chapter 5 of the 2017 NEC. The course has been approved by the State of Minnesota and will be reviewing code for the following subject - Special Occupancies. Your application for continuing education entitled 1 ATTEMPT 2017 NEC REVIEW: CHAPTER 1 has been approved with a course program id number 20170228 and approved until May 1, 2020. This course is approved for Electrical. Your application for continuing education entitled 1 ATTEMPT 2017 NEC REVIEW: CHAPTER 2 has been approved with a course program id number 20170229 and approved until May 1, 2020. Your application for continuing education entitled 1 ATTEMPT 2017 NEC REVIEW: CHAPTERS 3, 8, & 9 has been approved with a course program id number 20170230 and approved until May 1, 2020. Your application for continuing education entitled 1 ATTEMPT 2017 REVIEW: CHAPTER 4 has been approved with a course program id number 20170231 and approved until May 1, 2020. Your application for continuing education entitled 1 ATTEMPT 2017 NEC REVIEW: CHAPTER 5 has been approved with a course program id number 20170232 and approved until May 1, 2020. Your application for continuing education entitled 1 ATTEMPT 2017 NEC REVIEW: CHAPTER 6 has been approved with a course program id number 20170233 and approved until May 1, 2020. Your application for continuing education entitled 1 ATTEMPT 2017 NEC REVIEW: CHAPTER 7 has been approved with a course program id number 20170234 and approved until May 1, 2020. If you have further questions, please contact Josephine Steinhoff at 651-284-5034.